It’s true! Inspired by everyone’s favorite Flat Stanley, we’re introducing our very own FLAT MENDES. Now you can take The A-Mazing Mendes Cohen wherever you go – Mendes was an inveterate traveler, visiting locations all over the world. We want to see where YOU take him! 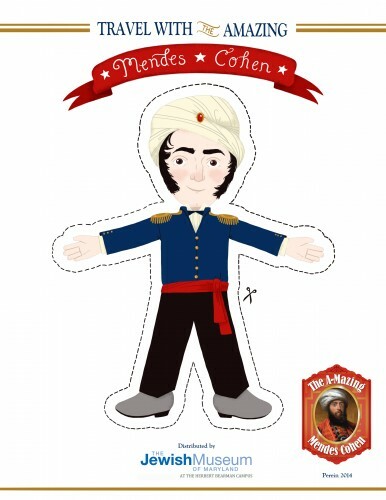 So download and print your own Flat Mendes – or stop by the Museum and pick one up. It’s Flat Mendes & he’s ready for adventure! The next step? Photos! Take pictures of your Flat Mendes in various locations – home, school, at the park, on vacation, wherever you think he’d like to visit. Then share those photos with us. Flat Mendes was designed by extremely talented, former JMM intern, Lisa Perrin (you can check out more of her work at her website, http://madebyperrin.com/).